Aurora Oil and Gas Ltd (TSE:AEF) (PINK:AAGLF) is beginning to show weakness in its short term price rally, but it will take some effort for the price to fall as it now sits above an important support of $3.00 per share. 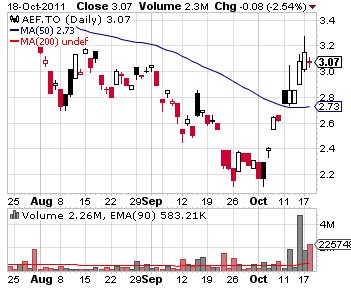 AEF added 41% over the past nine days since the share price bounced the short term bottom on October 5th. Starting last Friday, the stock continued to gain value under heavy trading volumes, but the recent price action suggests the price rally might be burning out. AEF had a trading volume of just above 2.2 million on Tuesday. That was most significant having in mind that the session closed lower from the previous day and even formed a spinning top candle, often used as an indicator for upcoming changes in trends. The company had no recent important news. The announcement that has caused the buying wave came out last week. According to the announcement, made on October 3, 2011, the company expects to drill 17 new wells in November and December 2011 and participate in drilling of another 123 wells throughout 2012. This way, Aurora seeks to retain their lease and should achieve their goal by Q3 2012. The company expects to reach 18.9 thousand boe/d production which could provide average revenues of $195 million per year. The cash to be used for this operation will be drawn from the recently announced $300 million credit facility.